Treatment at Platinum Physiotherapy will help resolve your knee and leg problems and facilitate your recovery. The leg is prone to a variety of injuries due to repetitive forces involved in weight bearing movements such as running, jumping and twisting. Physiotherapy will relieve pain and swelling and restore range of movement, strength, balance and stability, to enable you to reach your goals and achieve your maximum of physical functioning. An initial assessment will determine the underlying cause of your knee and leg problem. A graduated rehabilitation program will then be developed to ensure that your return to everyday activities, sport, hobbies as soon as possible with confidence and success. At Platinum Physiotherapy we will also advise you on how to pace your activity so that you return to sport and everyday tasks with confidence and success. Physiotherapy will promote healing, reduce pain and improve muscle strength and flexibility and speed up your recovery. Your physiotherapist will also advise you on how to pace your activity so that you return to sport and everyday as soon as possible and reduce the risk of re-injury. Physiotherapy will promote healing, reduce pain and improve muscle strength and flexibility and speed up your recovery. 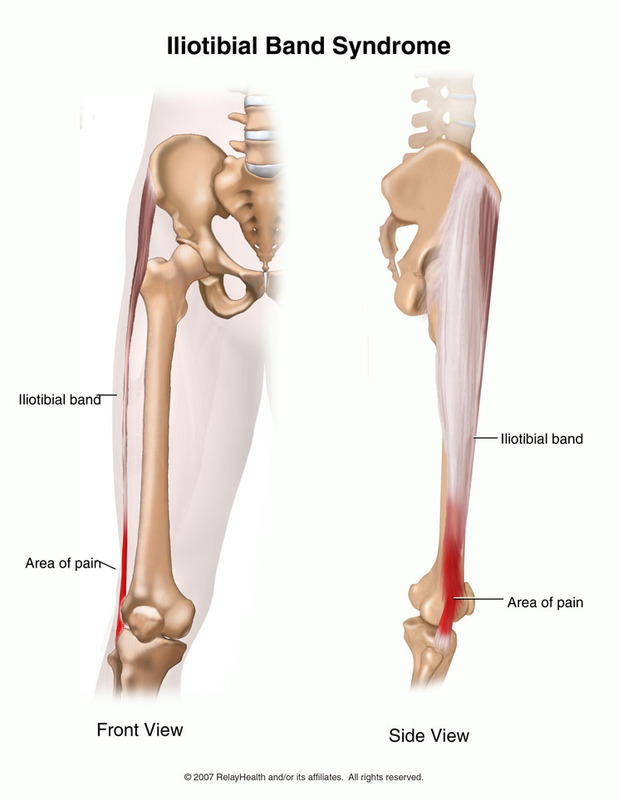 The Iliotibial (IT) band is the thick sheath of connective tissue that runs from the hip bone (femur) down the outside of the thigh and attaches to the outside of the shin bone(tibia). It acts to extend (straighten) the leg and abduct the hip (move it sideways). As this band passes over the bony part on the outside of the knee, it causes friction which leads to pain. Iliotibial band syndrome is sometimes referred to as runner’s knee or Iliotibial band friction syndrome which all mean the same thing. A burning sensation on the outside of the knee (most common), or along the entire sheath. A rehabilitation program and changes to your practice routine can bring about positive results. Rehabilitation will consist of manual therapy to relieve tightness in the IT band and get rid of trigger points in the gluteus (hip muscles). 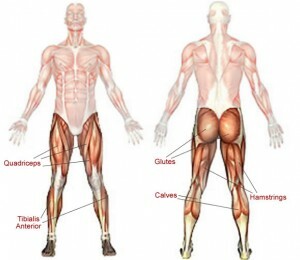 Strengthening of the hip abductors (muscles that move the hip outwards) are also critical to relieving this condition. The athlete can rest and apply cold therapy to the knee to reduce pain. Minimizing downhill running or eliminating it altogether will also be helpful. Wearing an orthotic support to reduce over-pronation is often recommended. Reduce initial pain and inflammation with the use of ice and ultrasound. Stretch the Tenser Fascia Latae muscle (a small muscle at the top of the thigh that helps to abduct the hip) and the iliotibial band to remove tightness. IT band syndrome is a condition that takes a long time to go away, months or even more than a year. Even after symptoms appear to cease, you still need to continue with prescribed exercises. It is therefore imperative that you consult a physiotherapist to help you get on the road to recovery. They will guide you in the proper way to stretch – you should not overstretch – and perform the strengthening exercises. Treatment at Platinum Physiotherapy will promote your recovery and get you back to the sports you enjoy as soon as possible with safety and confidence. Your physiotherapist will advise and support you on when and how to commence the right activities at the right time to improve flexibility, strength and function in a safe and effective way. Your physiotherapist will use a variety of specialist equipment such as weights, therabands, gym balls, trampette, wobbleboard and treadmill, to help you return to your normal sporting activities as soon as possible to the best of your ability. Anterior knee pain refers to pain over the front of the patella (kneecap) aggravated by climbing the stairs, prolonged bent-knee sitting, squatting, running and jumping activities. Softening of the cartilage cartilage that lines the underside of the kneecap (chondromalacia patellae). 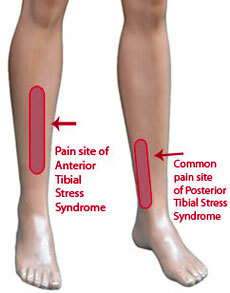 What are the symptoms/effects of anterior knee pain? People with anterior knee pain usually experience an aching pain at the front of the knee and around or under the knee cap that may increase to sharper pain with activity. Our specialised physiotherapist at Platinum Physiotherapy will provide accurate assessment and treatment as well as a careful explanation of your condition to ensure an optimal outcome in the short and long term. Your rehabilitation program will be tailored to your needs and lifestyle to ensure you get the most out of your treatment. Physiotherapy will reduce pain and stiffness, promote healing and increase muscles strength and flexibility in order to get you back to your normal activities as quickly as possible. The cartilage and tendons in your knees rely on a lubricating fluid called synovial fluid. This fluid helps your legs swing smoothly and reduces friction between the moving parts of your knees.Synovial fluid circulates throughout your knee and passes in and out of various tissue pouches (bursae) throughout your knee. A valve-like system exists between your knee joint and the bursa on the back of your knee (popliteal bursa). This regulates the amount of synovial fluid going in and out of the bursa.But sometimes the knee produces too much synovial fluid. 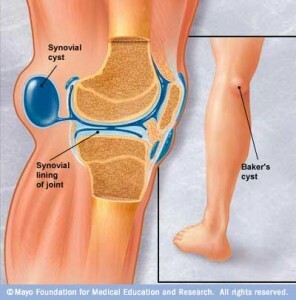 Most commonly this is caused by an inflammation of the knee joint, such as occurs with various types of arthritis or a knee injury, especially a cartilage tear.When the popliteal bursa fills with fluid and expands, the result is a bulge called a Baker’s cyst. Treating the probable underlying problem usually relieves the swelling and discomfort of a Baker’s cyst. These cysts occur most often in adults between 55 and 70 and in children between 4 and 7 years old. Up to one in five people with other knee problems may develop a Baker’s cyst. Rarely, a Baker’s cyst bursts and synovial fluid leaks into the calf region, causing sharp pain in the knee, swelling and sometimes redness of the calf. These signs and symptoms closely resemble those of a blood clot in your leg. If you have swelling and redness of your calf, you’ll need prompt medical evaluation, because a blood clot may require urgent treatment. If the cyst is very large and causes a lot of pain, your physiotherapist may use treatments including. Applying ice packs, a compression wrap, and crutches may help reduce pain and swelling. Gentle range of motion and strengthening exercises for the muscles around your knee may also help to reduce your symptoms and preserve knee function. If your doctor or physiotherapist determines that a cartilage tear is causing the overproduction of synovial fluid, he or she may recommend surgery to remove or repair the torn cartilage. In some instances, particularly if you have osteoarthritis, the cyst may not go away even after your doctor treats the underlying cause. If the cyst doesn’t get better, causes pain and interferes with your ability to bend your knee, or if — in spite of aspirations — fluid in the cyst hinders knee function, you may need to be evaluated for surgery to remove the cyst. Our physiotherapists at Platinum Physiotherapy commonly treat people following knee operations such as arthroscopies, meniscectomies, ligament reconstructions and knee replacements to promote healing and enhance recovery. At Platinum Physiotherapy, physiotherapy treatment before and after your knee operation will ensure you get back to the activities you enjoy to the best of your ability. LCL injuries typically occur during sporting activities when too much force is placed on the inside of the knee causing the fibres in the ligament to tear. Physiotherapy treatment will get you started on the right activities at the right time following a lateral collateral ligament (LCL) injury, to promote healing and facilitate recovery as quick as possible. Our specialised musculoskeletal physiotherapists will ensure you get the most out of your treatment and return to your normal sporting activities as soon as possible, by setting short and long term treatment goals tailored to you. At Platinum Physiotherapy we provide specialist assessment and treatment for MCL injuries to ensure you make the best possible recovery and get back to your previous level of activity or sport as soon as possible. At Platinum Physiotherapy, we have experienced musculoskeletal physiotherapists, who use a combination of hands-on techniques, electrotherapy and exercise to promote healing and maximise physical function. Physiotherapy treatment will ensure you make the best possible recovery following your injury and return to sport with confidence and success. People commonly damage their Posterior Cruciate Ligament (PCL) by a powerful force to the front of the upper shin, making it painful to walk. A person with a PCL injury will benefit from physiotherapy. A specialised rehabilitation programme from one of our dedicated physiotherapists at Platinum Physiotherapy will improve the movement in your knee and strengthen your muscles around it, so that you can return to everyday and sporting activities safely and effectively as soon as possible. Your physiotherapist will develop a structured rehabilitation program tailored to you to gradually strengthen your knee and keep your muscles flexible. Graduated exercise program including stretching and strengthening activities using therabands/weights. Your treatment program will progress you through a range of activities including short and long term goals, to ensure that you return to walking, running, and training at your normal level with success. Muscle strains – calf strains are the most common cause of calf pain. An initial assessment with one of our specialised physiotherapists at Platinum Physiotherapy will diagnose the cause of your calf pain and develop a treatment plan suited to this. At Platinum Physiotherapy, physiotherapy treatment will not only alleviate your calf pain but prevent future reoccurrence. There are various compartments in the lower leg that enclose the muscles. The posterior muscle compartment is the largest compartment in the lower leg that contains the calf muscles. What is Posterior Compartment Syndrome? Posterior Compartment Syndrome is a painful condition occurring when the muscles, nerves and blood vessels out-grow the space within the compartment created by the enclosing sheath. This increases the pressure inside the area and consequently on everything within the compartment causing pain. What Causes Posterior Compartment Syndrome? Posterior Compartment Syndrome can be caused by any acceleration movement which involves powerfully pushing off with the feet, like running, kicking, jumping or over-extending the foot by going up onto your heals or onto your tip toes. What are the symptoms/effects of Posterior Compartment Syndrome? The main symptoms of posterior compartment syndrome are pain and tightness along the inner aspect of the shin and / or back of the lower leg. These symptoms generally increase with exercise and decrease with rest and can occur in one or both legs. People may also experience a burning sensation or numbness in the calf and pins and needles in the foot. A thorough examination by a physiotherapist or doctor will diagnose compartment syndrome. Sciatica is a specific pain that originates from the sciatic nerves which each run from one side of the pelvis through the hip and buttocks and down the leg. The Sciatic nerve forms what is effectively an electrical cable to and from the brain. Sciatica is a condition where pain, weakness or altered sensation can be experienced in the buttock, hamstring, calf or foot but stem from the spine, via the Sciatic nerve. Although the cause of Sciatica lies in the spine, not all sufferers will experience back pain and symptoms can be variable. The problem can manifest as back pain with leg pain, or leg pain only. The major cause of Sciatica is a disc prolapse (more commonly known as a ‘slipped disc’) at the bottom of the back. Other factors however that can cause sciatica include injury to the buttocks, prolonged external pressure on the nerve, pressure from a tight muscle or nearby structure. Sciatic can be triggered by very small, normal movements like bending over to one side at a bad angle to pick something up, as well from suffering a trauma like falling off a ladder and landing on your back. 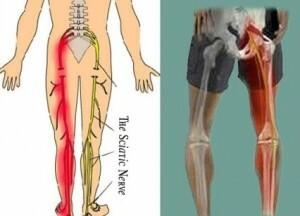 What happens in all cases is that the sciatic nerve is compressed and consequentially causes you pain. What are the symptoms/effects of Sciatica? The most common symptoms of sciatica is pain which can range from mild to debilitating. Other symptoms include weakness, numbness or tingling that generally begins in the lower spine and radiates down through the hips and buttocks and down the leg. Numbness of muscles, or a feeling of weakness, along the nerve pathway in the leg or foot. Physiotherapy treatment is very effective in the treatment of Sciatica. Physiotherapy treatment at Platinum Physiotherapy will relieve nerve root compression and prevent further episodes of sciatic pain by teaching correct postural techniques, and exercises to correct any muscle imbalance in the spine. Your treatment program will be suited to your needs and lifestyle to ensure you make significant long term improvements and continue with everyday activities you enjoy will less pain and discomfort. Physiotherapy at Platinum Physiotherapy will firstly involve an assessment to diagnose the cause of your shin pain followed by a comprehensive treatment plan to enhance recovery and get you back to your sporting and everyday activities as quickly as possible. Your physiotherapist will guide you through an individualised treatment program to reduce pain, improve muscle strength and length and prevent future reoccurrence. 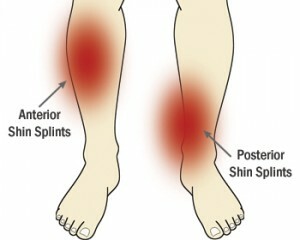 The term ‘shin splints’ has been used to describe pain along the inside border of the shin commonly experienced by runners. Your physiotherapist will devise a graduated training programme to promote recovery and help you return to your usual sports activities. Physiotherapy treatment will reduce pain and restore range of movement and strength to your muscles as soon as possible.